MED-DESIRE took part in the last edition of the international fair EGETICA 2015, celebrated in Valencia from 20th to 22th October. The Spanish partners of the project identified EGETICA 2015 of great interest and clearly aligned with the project objectives. Indeed, EGETICA is a must-attend event for the renewable energies and energy efficiency sector in Spain. 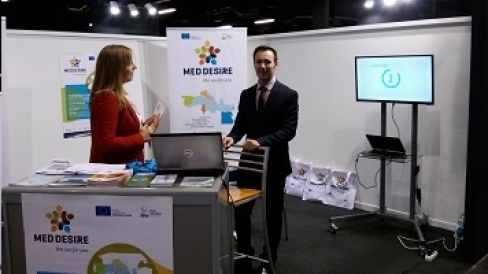 The participation of MED-DESIRE in EGETICA Fair with a space devoted to the project at the exhibition area arose important opportunities to promote project activities, to enhance contacts and exchange of knowledge with national and international networks of high competence consisting of companies, financial operators, scientific experts and institutional representatives. This edition of EGETICA has being attended by more than 297 national and international companies and organisations and attracted over 5,000 visitors from Spain and overseas (from 16 countries).